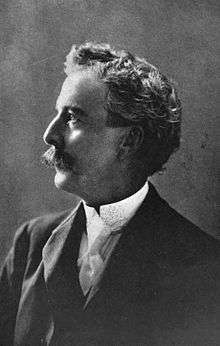 Luther Burbank (March 7, 1849 – April 11, 1926) was an American botanist, horticulturist and pioneer in agricultural science. He developed more than 800 strains and varieties of plants over his 55-year career. Burbank's varied creations included fruits, flowers, grains, grasses, and vegetables. He developed (but did not create) a spineless cactus (useful for cattle-feed) and the plumcot. Burbank's most successful strains and varieties include the Shasta daisy, the fire poppy (note possible confusion with the California wildflower, Papaver californicum, which is also called a fire poppy), the "July Elberta" peach, the "Santa Rosa" plum, the "Flaming Gold" nectarine, the "Wickson" plum (named after agronomist Edward J. Wickson), the freestone peach, and the white blackberry. 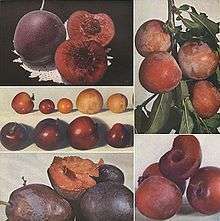 A natural genetic variant of the Burbank potato with russet-colored skin later became known as the Russet Burbank potato. This large, brown-skinned, white-fleshed potato has become the world's predominant potato in food processing. The Russet Burbank potato was in fact invented to help with the devastating situation in Ireland during the Irish Potato famine. This particular potato variety was created by Burbank to help "revive the country's leading crop" as it is blight-resistant. The blight is a disease that spread and destroyed potatoes all across Europe but caused extreme chaos in Ireland due to the high dependency on potatoes as a crop by the Irish. Born in Lancaster, Massachusetts, Burbank grew up on a farm and received only an elementary school education. The thirteenth of eighteen children, he enjoyed the plants in his mother's large garden. His father died when he was 21 years old, and Burbank used his inheritance to buy a 17-acre (69,000 m²) plot of land near Lunenburg center. There, he developed the Burbank potato. Burbank sold the rights to the Burbank potato for $150 and used the money to travel to Santa Rosa, California, in 1875. Later, a natural vegetative sport (that is, an aberrant growth that can be reproduced reliably in cultivation) of Burbank potato with russetted skin was selected and named Russet Burbank potato. Today, the Russet Burbank potato is the most widely cultivated potato in the United States. A large percentage of McDonald's french fries are made from this cultivar. In Santa Rosa, Burbank purchased a 4-acre (16,000 m2) plot of land, and established a greenhouse, nursery, and experimental fields that he used to conduct crossbreeding experiments on plants, inspired by Charles Darwin's The Variation of Animals and Plants under Domestication. (This site is now open to the public as a city park, Luther Burbank Home and Gardens.) Later he purchased an 18-acre (7.3 ha) plot of land in the nearby town of Sebastopol, called Gold Ridge Farm. Burbank became known through his plant catalogs, the most famous being 1893's "New Creations in Fruits and Flowers," and through the word of mouth of satisfied customers, as well as press reports that kept him in the news throughout the first decade of the century. In that same year, Stark Bro's Nurseries & Orchards Co. discovered the 'Delicious' apple, an elongated fruit with five bumps on the calyx end. The oddly-shaped apple attracted the attention of Burbank, a famed grafter and budder of trees, plants and flowers. He called the new 'Delicious' variety “the finest-flavored apple in all the world.” It was also in 1893 that the Starks began their storied cooperation with Luther Burbank and his fantastic new varieties of fruits. Among those with the foresight to recognize the possibilities of Burbank’s work was Clarence McDowell Stark, who went to California and sought Burbank out. After talking to him in Santa Rosa and seeing the results of his experiments, Clarence was convinced that Burbank was right and his professorial critics were wrong. To Clarence’s great dismay, he saw that Luther Burbank was operating a small seed and nursery business in an attempt to finance his experiments and provide himself a living. It was clear that he would never be able to realize his potential under these meager circumstances. Burbank often credited the Stark family with making his work profitable. In return, he later joined with Thomas Edison to support Paul Stark Sr. in his fight to get patent legislation passed for plant breeders. Along with Clarence’s $9,000 worth of help, Luther also had something of a fan club — The Luther Burbank Society. The group took it upon themselves to publish his discoveries and manage his business affairs, affording him some additional means by which to live. From 1904 through 1909, Burbank received several grants from the Carnegie Institution to support his ongoing research on hybridization. He was supported by the practical-minded Andrew Carnegie himself, over those of his advisers who objected that Burbank was not "scientific" in his methods. Gastrointestinal complications and violent hiccups weakened Luther in the last two weeks before his death, which was ultimately caused by heart failure. At his bedside were Elizabeth and his sister when he died on April 11, 1926. 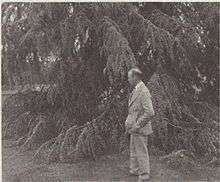 The famous botanist was buried in an unmarked grave, under a giant Cedar of Lebanon at the Luther Burbank Home and Gardens in Santa Rosa, California. The tree in the photo is sadly no longer there. He named Stark Bro’s Nurseries & Orchards Co. to carry on the work. Considerable argument has been spent upon whether the plants were technically willed to Stark Bro’s; they were not. He left everything to Elizabeth: money, personal property, real estate, dozens of municipal utility bonds — and the plants and precious seeds. Elizabeth had first approached both Stanford and Berkeley to have either or both universities take over the experimental farm, but sold to Stark when those proffers didn’t materialize.Mrs. Burbank entered into an agreement with Stark Bro’s on Aug 23, 1927 to take the material they wanted from Burbank’s properties. The contract included ownership of the business name and all of the customer information. A September 6, 1927 contract provided exclusive rights to sell uncompleted experiments with fruits at Sebastopol (except the Royal and Paradox) for 10 years. Stark Bro’s had right of renewal. Tax receipts indicate payments of $27,000 to Mrs. Burbank. 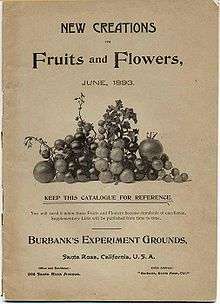 Exciting new kinds of fruits and flowers Burbank had developed (but never marketed) included 120 types of plums, 18 peaches, 28 apples, 500 hybrid roses, 30 cherries, 34 pears, 52 gladioli and many more. Stark Bro’s subsequently introduced many of these varieties in their catalog. 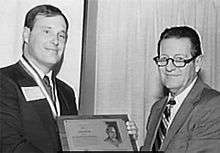 Clay Stark Logan (l) accepting induction into the National Inventors Hall of Fame on behalf of Luther Burbank (1986). Until 1931, the Experiment Farm fell into some disrepair, so Stark Bro’s sent emissaries to retrieve the most promising fruit, nut and ornamental shrubs, and in 1931 sold the flowers, vegetables and seeds to Burpee Seed Co. J. B. Keil came from Stark Bro’s to coordinate the efforts and worked there from 1931 to 1934. Over the following years, Elizabeth worked with the Stark brothers to patent 16 Burbank fruits and flowers. The patents name Luther Burbank, deceased, as “inventor” by Elizabeth Waters Burbank, executrix of his estate. In 1935, Stark ended the agreement with Mrs. Burbank (or vice versa). Mrs. Burbank then dispersed the majority of the gardens for subdivision. She sold the remaining property (excluding the house and greenhouse) to the Santa Rosa Junior College for use as a training ground. This lasted until 1954 (J. B. Keil stayed on as the caretaker).Twenty years later, the City took over ownership of the property (which it retains today as a free public showplace). The gardens include a thornless rose, spineless cactus, rainbow corn, a hybrid mulberry tree (which Luther hoped would spark an American silk industry) and his spectacular red combustion plant. At the test orchards in Louisiana, Missouri, in Sebastopol, California and Atlas, Illinois, the Starks kept faith with the Burbank trust, and still do. The Garden Center is housed in The Luther Burbank Building. Stark Bro’s has produced or discovered superior varieties or strains of more than 300 varieties of pears, plums, peaches, cherries, grapes, prunes, strawberries, raspberries and ornamentals. These discoveries are a direct result of being chosen to carry on Luther’s experiments. The Starks have often gratefully remarked that the company would never have been as successful without their association with Luther Burbank. 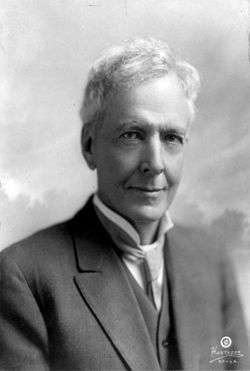 The great Luther Burbank was posthumously inducted into the National Inventors Hall of Fame on February 10, 1986 by then-president Clay Stark Logan, an enormous honor for him and the Stark family. Forms of leaves and fruits quality correlations. After issue 1914. Burbank created hundreds of new varieties of fruits (plum, pear, prune, peach, blackberry, raspberry); potato, tomato; ornamental flowers and other plants. Burbank was criticized by scientists of his day because he did not keep the kind of careful records that are the norm in scientific research and because he was mainly interested in getting results rather than in basic research. Purdue University professor Jules Janick, writing in the 2004 World Book Encyclopedia, says: "Burbank cannot be considered a scientist in the academic sense." Although Burbank may not have been a scientist by modern standards, his lack of record keeping reflects the era in which he lived. His innovations were revolutionary, and in a time when there was no way to legally protect one's inventions, Burbank may have been cautious with the successes he decided to document. Additionally, his records may not have been coherent (to the chagrin of modern scholars) because he felt his time was better valued in the garden, not writing each trial and error down in his record book. In 1893, Burbank published a descriptive catalog of some of his best varieties, entitled New Creations in Fruits and Flowers. In 1907, Burbank published an "essay on childrearing", called The Training of the Human Plant. In it, he advocated improved treatment of children. During his career, Burbank wrote and co-wrote several books on his methods and results, including his eight-volume How Plants Are Trained to Work for Man (1921), Harvest of the Years (with Wilbur Hall, 1927), Partner of Nature (1939), and the 12-volume Luther Burbank: His Methods and Discoveries and Their Practical Application. Burbank experimented with a variety of techniques such as grafting, hybridization, and cross-breeding. Intraspecific hybridization within a plant species was demonstrated by Charles Darwin and Gregor Mendel, and was further developed by geneticists and plant breeders. In 1908, George Harrison Shull described heterosis, also known as hybrid vigor. Heterosis describes the tendency of the progeny of a specific cross to outperform both parents. The detection of the usefulness of heterosis for plant breeding has led to the development of inbred lines that reveal a heterotic yield advantage when they are crossed. Maize was the first species where heterosis was widely used to produce hybrids. By the 1920s, statistical methods were developed to analyze gene action and distinguish heritable variation from variation caused by environment. In 1933, another important breeding technique, cytoplasmic male sterility (CMS), developed in maize, was described by Marcus Morton Rhoades. CMS is a maternally inherited trait that makes the plant produce sterile pollen. This enables the production of hybrids without the need for labour-intensive detasseling. These early breeding techniques resulted in large yield increase in the United States in the early 20th century. Similar yield increases were not produced elsewhere until after World War II, the Green Revolution increased crop production in the developing world in the 1960s. Classical plant breeding uses deliberate interbreeding (crossing) of closely or distantly related individuals to produce new crop varieties or lines with desirable properties. Plants are crossbred to introduce traits/genes from one variety or line into a new genetic background. For example, a mildew-resistant pea may be crossed with a high-yielding but susceptible pea, the goal of the cross being to introduce mildew resistance without losing the high-yield characteristics. Progeny from the cross would then be crossed with the high-yielding parent to ensure that the progeny were most like the high-yielding parent, (backcrossing). The progeny from that cross would then be tested for yield and mildew resistance and high-yielding resistant plants would be further developed. Plants may also be crossed with themselves to produce inbred varieties for breeding. Classical breeding relies largely on homologous recombination between chromosomes to generate genetic diversity. The classical plant breeder may also make use of a number of in vitro techniques such as protoplast fusion, embryo rescue or mutagenesis (see below) to generate diversity and produce hybrid plants that would not exist in nature. Burbank cross-pollinated the flowers of plants by hand and planted all the resulting seeds. He then selected the most promising plants to cross with other ones. Luther Burbank – "The Wizard of Horticulture"
By all accounts, Burbank was a kindly man who wanted to help other people. He was praised and admired not only for his gardening skills but for his modesty, generosity and kind spirit. He was very interested in education and gave money to the local schools. He married twice: to Helen Coleman in 1890, which ended in divorce in 1896; and to Elizabeth Waters in 1916. He had no children. I love humanity, which has been a constant delight to me during all my seventy-seven years of life; and I love flowers, trees, animals, and all the works of Nature as they pass before us in time and space. What a joy life is when you have made a close working partnership with Nature, helping her to produce for the benefit of mankind new forms, colors, and perfumes in flowers which were never known before; fruits in form, size, and flavor never before seen on this globe; and grains of enormously increased productiveness, whose fat kernels are filled with more and better nourishment, a veritable storehouse of perfect food—new food for all the world's untold millions for all time to come. Luther Burbank was highly revered through the United States of America. In September 1905 a group of California's most influential businessmen, intellectuals, and politicians gathered at a banquet thrown in honor of Luther Burbank by the State Board of Trade. Many people spoke about Burbank such as Senator Perkins who stated that Burbank could teach the government valuable lessons and he stated that "he is doing more to instruct, interest, and make popular the work in the garden than any man of his generation." At the same convention, Albert G. Burnett, a judge of the Superior Court for Sonoma County stated that Burbank had improved the community incredibly making it a place that people came "to sit at the feet of this great apostle and prophet of beauty and happiness... and catch some measure of his matchless inspiration." He also stated that Burbank's deeds were always done to "bring more of the sunshine of comfort and happiness into the cottages of the poor as well as the palaces of the rich." In mid-March 1926, Burbank suffered a heart attack and became ill with gastrointestinal complications. He died on April 11, 1926, aged 77, and is buried near the greenhouse at the Luther Burbank Home and Gardens. Burbank's fame and admiration reflect the various ways people see humans' roles in nature, by representing both the importance of our connection to the natural world and the numerous possibilities created by plant manipulation. Burbank's work spurred the passing of the 1930 Plant Patent Act four years after his death. The legislation made it possible to patent new varieties of plants (excluding tuber-propagated plants). Thomas Edison testified before Congress in support of the legislation and said that "This [bill] will, I feel sure, give us many Burbanks." The authorities issued Plant Patents #12, #13, #14, #15, #16, #18, #41, #65, #66, #235, #266, #267, #269, #290, #291, and #1041 to Burbank posthumously. In 1940, the U.S. Postal Service issued a 3-cent stamp honoring Burbank. In 1986, Burbank was inducted into the National Inventors Hall of Fame. The Luther Burbank Home and Gardens, in downtown Santa Rosa, are now designated as a National Historic Landmark. Luther Burbank's Gold Ridge Experiment Farm is listed in the National Register of Historic Places a few miles west of Santa Rosa in the town of Sebastopol, California. The home that Luther Burbank was born in, as well as his California garden office, were moved by Henry Ford to Dearborn, Michigan, and are part of Greenfield Village. ↑ Smith, Jane S. (2010). The Garden of Invention : Luther Burbank and the business of breeding plants. New York: Penguin Group. pp. 1–2. ISBN 978-0143116899. ↑ "Luther Burbank, Biography". Retrieved December 17, 2012. 1 2 3 4 5 Zotta, LeAnn (2015). 200 Years and Growing: The Story of Stark Bro's Nurseries & Orchards Co. IngramSpark. ↑ Stark, Clarence (1913). "Stark Delicious: The World's Best Apple". Stark Bro's Nurseries & Orchards Catalog. Retrieved May 18, 2016. ↑ Janick, Jules (February 2015). "Luther Burbank: Plant Breeding Artist, Horticulturist, and Legend" (PDF). HortScience. Retrieved May 18, 2016. ↑ "Duke University Libraries - Digital Collections". Duke University Libraries - Digital Collections. Luther Burbank Society. 1912. Retrieved May 18, 2016. ↑ "Luther A. Burbank". Find A Grave. January 1, 2001. Retrieved May 18, 2016. ↑ "Luther Burbank: Honorary Member of the American Breeders' Association". oxfordjournals.org. ↑ Smith, Jane S. "Faster, Better, Sweeter." The Garden of Invention: Luther Burbank and the Business of Breeding Plants. New York: Penguin, 2009. N. pag. Print. 1 2 Smith, Jane S. "Prologue." The Garden of Invention: Luther Burbank and the Business of Breeding Plants. New York: Penguin, 2009. Print. ↑ Denis Murphy (30 August 2007). Plant Breeding and Biotechnology: Societal Context and the Future of Agriculture. Cambridge University Press. pp. 38–. ISBN 978-1-139-46557-1. 1 2 Smith, Jane S. (2009). The Garden of Invention. New York: Penguin Books. pp. 3–6. ISBN 978-0143116899. ↑ http://files.eric.ed.gov/fulltext/ED402584.pdf "Burbank the Plant Wizard, the man who created "a good firm shipper's fruit suitable for canning" and a miraculous garden of "hybrid" flowers, admitted during an interview that he was an atheist"
↑ "Stamp Series". United States Postal Service. Retrieved Sep 2, 2013. Bailey, Liberty H. (August 1901). "A Maker of New Fruits and Flowers: How Luther Burbank Breeds New Varieties of Plants on His California Farm". The World's Work: A History of Our Time. II: 1209–1214. Retrieved 2009-07-09. Burbank, Luther. "The Training of the Human Plant". Century Magazine, May 1907. Smith, Jane S. (2009). The Garden of Invention: Luther Burbank and the Business of Breeding Plants. Penguin Group (USA). ISBN 978-1-59420-209-4. Burbank, Luther with Wilbur Hall, Harvest of the Years. This is Luther Burbank's autobiography published posthumously after his death in 1926. Burt, Olive W. Luther Burbank, Boy Wizard. Biography published by Bobbs-Merrill in 1948 aimed at intermediate level students. Pandora, Katherine. "Luther Burbank". American National Biography. Retrieved on 2006-11-16. Harte, Bret (September 1903). "King of Horticulture". Overland Monthly. XLII: 226–233. Tuomey, Honoria. "Luther Burbank, Scientist." Out West magazine, September 1905. pages 201-222. illustrated. Wikimedia Commons has media related to Luther Burbank. A complete bibliography of books by and about Luther Burbank on WorldCat. Luther Burbank: His Methods and Discoveries and Their Practical Application, a 12-volume monographic series, is available online through the University of Wisconsin Digital Collections Center. "Burbank, Luther". New International Encyclopedia. 1905.